Interestingly enough, the concept of burglar alarms dates back thousands of years to a time when dogs were used to warn humans of an intruder like today’s burglar. Their barking was the alarms that alerted the people around them that something may be amiss. 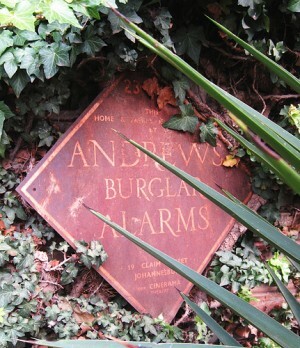 After a while, people began using chimes as burglar alarms. Today, these security systems have become extremely elaborate thanks to technological advances and innovations. The first of these modern day burglar alarms was invented in Boston in 1852 by a gentleman named Edwin Holmes. His design was very basic and involved the use of a tripwire which powered a solenoid with electricity and caused a gong to be struck once it was activated. At that point in time he moved to New York to start his business. The American Telephone and Telegraph Company purchased Holmes’ business in 1905. By using the city’s more advanced electrical grid, AT&T was able to link a person’s alarms to local fire and police departments. Beginning in the 1970’s, motion sensors were added to a number of burglar alarms on the market. They employed very simple ultrasonic technology which was emitted by the sensors and then reflected back. If a burglar entered a person’s home, and tripped one of the sensors, it would cause a change in the sound and trigger the alarms. Further advancements in the 1980’s introduced the use of infrared technology so that sensors could avoid false positives. Electrical components that were more sophisticated and employed superior technology enabled the advent of full home security systems. The prices of burglar alarms began falling during the 1990’s and many companies started including the installation of these systems in the price of them. Many of these companies also began including a monthly monitoring fee that was then paid to the service who handled that part of the equation. Today, burglar alarms come in a variety of sizes and types based on whether you want a system that is directly wired into your home’s electrical, known as a hard-wired system or you can purchase wireless systems. Additionally, the systems available today have integrated with a number of different safety services as well as with phone support from the companies themselves. With all the technological advancements and innovations that have developed with burglar alarms in recent years and their declining prices, many homeowners today have a number of viable options to choose from for protecting their homes. Although today’s burglar is smarter than what they were years ago, these alarms are still a wise decision as a means to protect one’s family and home. Previous post: Why have wireless burglar alarms become so popular?